There’s no room for mistakes when it comes to commercial HVAC (heating, ventilation, and air conditioning). United Service Co. is a family owned business with a history that dates to 1953. We are experts in our industry with highly trained technicians in commercial refrigeration, heating, and cooling. We have what it takes to fulfill virtually any commercial or industrial HVAC need, from new installations to routine maintenance checks. Our crew can help you maximize the performance of your unit year round. You’ll never worry about the health, status, or life span of your commercial HVAC system again. Learn about our HVAC services. Rooftop units. A commercial rooftop system is an innovative way to keep costs down while maintaining a comfortable business environment. Rooftop units on the market include solar-powered systems for optimal energy efficiency. We offer 1-ton to 50-ton rooftop units for sale. Mini-split systems. This is a ductless heating and cooling system that saves room inside a facility. A mini-split unit works using an outdoor compressor and a wall-mounted unit. There are several benefits to these systems, including saved space and better energy efficiency than ducted systems. Heat pumps. Commercial-grade heat pumps maintain a comfortable environment without wasting energy. They are an excellent alternative to conventional air conditioning with several different systems to choose from. Our team at United Service Co. can help you select the right heat pump for your facility and goals. Exhaust hoods. We can sell, install, and service exhaust hoods of several different sizes. The right range hood will improve the safety of your commercial kitchen and provide adequate ventilation for your chefs. Exhaust hoods significantly improve the comfort of the kitchen environment. Makeup air systems. Balance your kitchen’s airflow, exhaust, and intake with a high-quality makeup air system. This component can make all the difference in the comfort and safety of your facility. We can install makeup air for range hoods and help you set up an appropriate maintenance schedule. Exhaust fans. Exhaust and ventilation fans are important elements in your commercial HVAC system. Our team partners with trusted equipment suppliers to offer our customers a variety of dependable exhaust fans. Remove unwanted heat, fumes, and odors from your facility with the right fan system. When it comes to your HVAC services, don’t just settle. Work with United Service Co. for equipment and parts you can trust. We are a premier destination for business owners in need of consistent high quality. Read our testimonials for proof of our satisfied customers. We’ve helped thousands of businesses optimize their heating and cooling systems in the last 60-plus years. You can join our list of happy customers – we’re just a phone call away. How often do I need preventative maintenance? Your commercial HVAC system works hard all year to keep your business cool in summer and warm in winter. It requires regular maintenance before every season to make sure it’s ready for the upcoming months. Our preventative maintenance program can give you year-round peace of mind with component checks, cleaning, and minor repairs. How long will my system last? That depends on how well you take care of it. A commercial HVAC system can have a life span of anywhere from 10 to 25 years or more depending on the type of equipment and maintenance level. Preventative maintenance and repairs from experienced professionals can lengthen the life span of your unit. Should I have to add coolant to my system? Yes and no. Leaking coolant is a problem all HVAC systems experience at some point, due to typical wear and tear. If you must regularly add coolant, on the other hand, this is a sign of a problem. Call an HVAC technician to find the source of the leak and make repairs or replacements. How often should I change the air filters? This depends on your system and the type of filters you use. You don’t want to allow your filters to get too dirty or clogged, as this can block airflow and lead to an overworked or overheated system. Check your filters every month and change them when they appear dirty. A professional can help you with this task if necessary. How is my indoor air quality? As a business owner, it’s your duty to ensure good air quality for your employees and customers. Your commercial HVAC system can have a lot to do with air quality. Dusty, dirty filters and ductwork can lead to contaminants like pollen and microbes in the air. United Service Co. can help you breathe easy when it comes to indoor air quality. Our technicians are happy to address your specific questions and concerns when you contact us. We can come to your business, inspect your system, and give you an estimate for preventative maintenance or repairs. We can also give you professional advice as to system upgrades, replacements, and new installations. We are your one-stop shop for all things commercial HVAC in the area. Schedule Commercial HVAC Services Today! 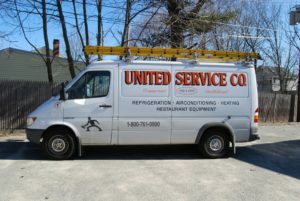 United Service Co. is available 24/7 for emergency heating and cooling repairs. We work hard to make sure our customers never go for long without efficient commercial HVAC. Local area residents can call (800) 761-0900 today to schedule your services with our capable team.